These diabetic socks provide unrestrained blood flow due to non binding top and non elastic leg. The sole is cushioned and soft with looped toe for extra comfort. Anti microbial agents provide freshness. 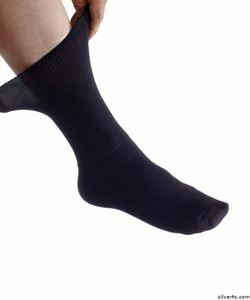 These socks are made up of cotton-nylon-polyester-spandex and are best for diabetic and swollen feet. Comes in One standard size. Available in Black, Navy, Tan and White.